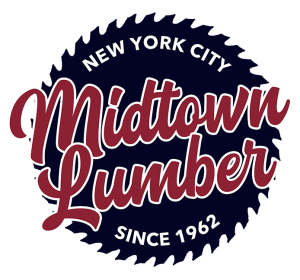 Plexiglass is a non-wood product sheet that we sell at Midtown Lumber. Sometimes referred to as Acrylic, Plexiglass is a common replacement for regular glass. This is a good replacement because it can be cut to size as well as for safety reasons. Since it is made out of plastic, it is much less dangerous if it breaks and it is considerably more durable. This material is commonly used for damaged windows for these reasons as well as its insulating properties. If you are planning on using Plexiglass during your next project, make sure you know that it is not paintable or stainable. If you need to screw Plexiglas onto something, you have to drill it first. We carry Plexiglass in sheets of 4’ x 8’ (48” x 96”) and thicknesses of ¼” and ⅛”. If you have any further questions regarding its properties and uses, reach out!